The Fall runways were filled with brilliant brocade embellished clothing, which are a perfect way to add a touch of luxury and sheen to your wardrobe. 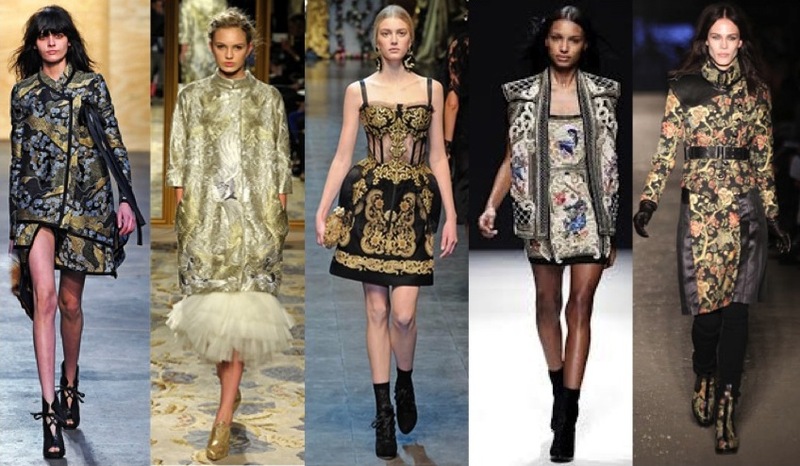 Brocades fall into two camps this season, opulent Baroque-inspired such as those at Dolce and Gabbana and Balmain and eastern influenced like the oriental brocades seen at Proenza Schouler's Fall 2012 runway show. Whether you are looking for a show-stopping brocade cocktail dress or a brocade pencil skirt to add some sass to your work wardrobe, there are plenty of options in stores. On my wish list? MW Matthew Williamson's leopard brocade jacket and Elizabeth and James' Yumi brocade peplum blouse. Love brocades! I have a bolero jacket from H&M a few seasons back that will get a lot of wear this winter. I love this trend for fall! I would love a pair of pants like that, such a chic touch to my wardrobe. I love brocades for fall--I'm hoping to find a piece that works for me. I love that floral skirt you included! Dolce & Gabbana is my love! I am absolutely loving everything. What gorgeous pieces! The jacket is perfection! Has just been added to my wish list as well! Love the brocades!!! amazing post great picks ! 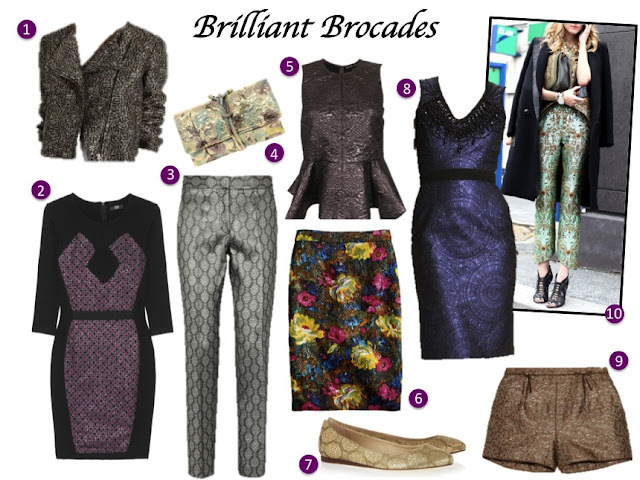 I love brocade, they are so elegant and has a great vintage feeling. Thanks for your comment and following my blog. I love your blog and I'm following you! I love all of these pieces! Especially that gorgeous skirt! I'm really looking forward to fall so I can start wearing rich textured pieces like these! back on GFC, so see you again on my blog. balmain and dolce&gabbana the best absolutely! Im Irene (Ire for friends) and I´m your new follower. What's up fellow San Franciscan fashion blogger! Haha :) Digging this fall trend alert post--sparkly brocades seemed to be such a staple for winter, and I'm especially enjoying the bold colors and prints that seem to match so well with gold and silver. Excellent post, well done! I love this look and can't wait to find a few great embroidered pieces for fall. I am loving this trend at the moment! love those Stella McCartney pants!!! I saw them in a magazine recently. great post!